I recently stumbled upon this product and I may be addicted. This popcorn brings memories flooding back from my elementary school days when we used to make baked dill oyster crackers. There is just enough flavor on this popcorn to make your taste buds sing and it is not greasey, heavy or buttery. 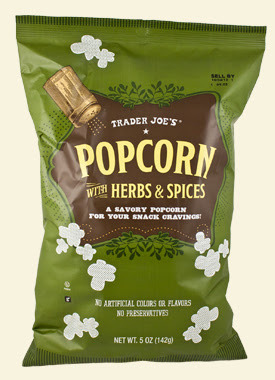 I have been taking my own popcorn to the theater for a couple years now, and this yummy bag will definetly be on my pack list the next time I hit a theater. 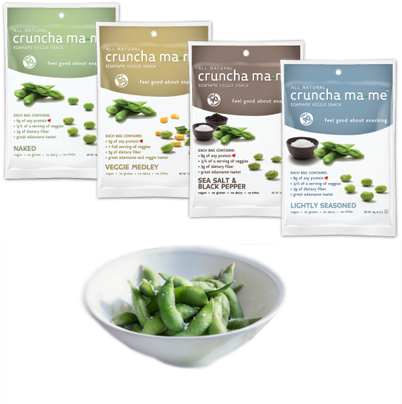 Another product that I stumbled acrossed this weekend is Freeze Dried Edamame. This product is a little harder on the pocket, but if you think of it as a similar snack as a protein bar the price is comparable. This product is high in protein (soy protein) and low on sodium, preservatives, and gunky yucky stuff. It is surprisingly filling, which is because of the protein content. I was at Whole Foods when the guy stopped me for a taste test of these, but I may be pecking around to see if I can find them at a little lower price somewhere else. I love Whole Foods but some things can be bought elsewhere. Pictured above was a quick weekend lunch; I am pretty sure I ate it standing while doing 4 other things. Atleast I wasn't at a computer eating my meals, which was last week's theme. The idea started with the purchase of the Hawaiian rolls. I quickly started craving a Hawaiian pineapple chicken salad sandwich. I attempted to recreate the sandwich that Billy's in Newport Beach features. I went with half mayo and half yogurt, inorder to keep the healthy touch there. Mine was good, but they definetly have know-how on that sandwich. With summer slowly making it's entrance, I have been embracing fruit with open arms, the last couple weeks. Here in Huntington Beach, it was not much of a sunny weekend, but that's ok, as I had plenty to do and I would only have been hoping to squeeze in an hour of layout time by the pool, had it been gorgeous out. I went out on a limb and bought a flat of nectarines at Costco last weekend, which we all know can be hard to get through sometimes if you don't have a big family eating it. I was able to utilize about 5 or 6 of them during the "weekend of bbq's" (A.K.A. last weekend), by making them a hearty part of a fruit salad. And then we (mostly I) happily munched on the rest throughout the week. Kiwi is a fun treat too and it is high in potassium. Potassium has been my new "pay attention to eating project" the last couple of weeks. I have figitty legs and we recently read that this (undiagnosed, restless legs syndrome, which I share with a few of my family members) could be partially alleviated by extra potassium. Hey, I'm willing to give it a try and my couch partner is rooting the experiment on; if I'll sit still while sitting next to him he'd probably serve me liver. Just a side note, I am squeezing in some computer time while my hubby cooks up a Sunday supper built around the red snapper which he caught over the weekend on a boys fishing trip. They did a one night overnighter from Long Beach to the Channel Islands. He tied for the most fish caught on the boat, 14! Yes, he cooks and hunts. Can't wait until Lobster season, maybe we'll have a Lobster bisque on the fall menu.